The world got a glimpse of the world’s largest containership yesterday at the naming cermomy of the 20,150 teu MOL Triumph . 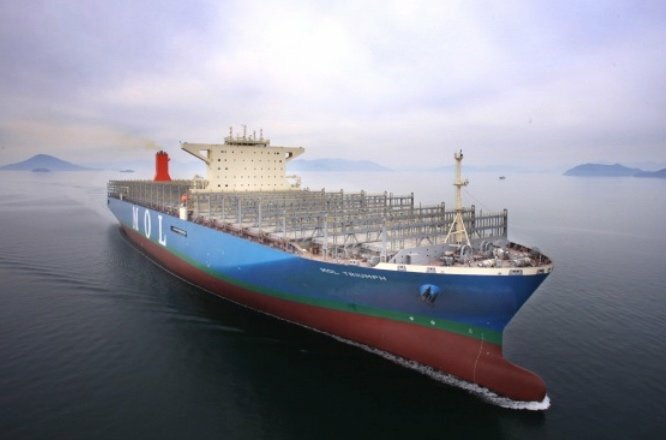 The giant 400 m long blue-hulled ship was built by Samsung Heavy Industries in South Korea and is the first of four Mitsui OSK Lines (MOL) of Japan has ordered at the yard. The 58.8m wide vessel will be delivered to its owner on March 27. Its reign as the world’s largest boxship will be brief however. Hong Kong’s Orient Overseas Container Line (OOCL) has six massive ships nearing 21,000 teu in capacity due to deliver from the same yard starting later this year. What do you believe is going to happen to the office people, e.g. Logistic, import, export, port staffs, etc of NYK, MOL & K-Line when the three Japanese Container Line’s consolidated in April of 2018? NICE – A REAL DISASTER IN THE WAITING. A COMPANY WHICH IS LOOSING MILLIONS, HUNDREDS OF MILLIONS – IS BURNING MONEY ON THIS DUMB SIZE VESSELS. FOR WHAT – EGO ?????? WHAT A WORLD WE LIVE IN, WHAT A WORLD ?? who remembers Sanco [over building] or Jahre Viking [size]? “mix hipster technologies with roughneck industries” — George, as your humble editor, permission to steal this line one day?! !